This is the 9th post in the series, 14 Tips to Present Awesome Charts. Your chart is made from raw data. But this raw data is not a fiction of your imagination. It has a source. A source from where you culled out the data for analysis and representation. We will today discuss about this most ignored element of a chart; source of data. 1. Why you need to worry about the source? 2. When should you mention the source and when you need not? 3. How and where do you mention the source of data in your chart? Imaging this situation: You are in-charge of new product launches in your company. You have studied the fairness soap market for men in India and in your presentation to the CEO you are recommending to launch a new soap brand. In the process of research you would have come across lots of data. When you present it, your CEO might ask; "Where did you get this data from?" All that he is asking for is; tell me the source of data. For the audience to accept your charts' key message (the point you are trying to make), they need to know if the chart is credible. They might not ask for the source always, but having it on the chart enhances the credibility of your argument. 2. When should you mention the source and when you should not? When you are presenting something from your area of expertise (domain), you do not need to compulsorily mention a source. The credibility comes from you (the presenter) and your audience knows about your expertise. They trust you. But, it is possible that you are presenting something outside your domain. In which case, the audience would like to know the source of your data. This chart gives you data on world's crude steel production. Now a shareholder might ask; "Why should I trust this data? You may be the largest steel company in the world, so what?" To answer this doubt which many people will (subconsciously) have, they have mentioned the source. 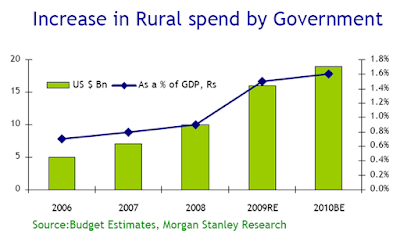 Here, the FMCG company is talking about how the Government of India is planning to increase spends in Rural India. This will lead to a demand increase for FMCG and hence Dabur will benefit. The investor might ask, "What expertise do you have to talk about government spending?" That is why they mention the source of data. 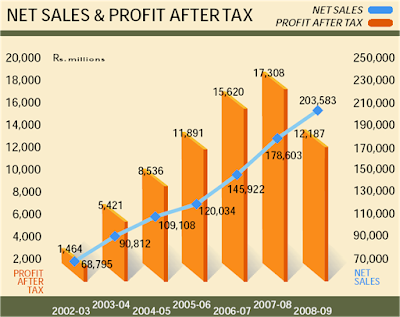 In this chart the company is sharing its financial results from 2002-03 to 2008-09. They have not mentioned any data source. It is internal data and they are the best people to know that. There is enough internal credibility and thus need for a source is eliminated. 3. How and where to mention the source? If you notice the charts above, the source has been mentioned below the chart. I would advise you to follow the same. Instead of hiding it somewhere is minuscule size font, mention it just below the chart in a font size that is easy to read. But how do write the source? In how much detail? Ask yourself this question and you will know in how much detail should you write the source: "If your audience wanted to check your data with the source, can they do that easily." If no, then re-write the source to make it easier to verify. Let us see example 4. Example 4: A presentation by Doug Baillie in 2007, the CEO of Hindustan Unilever available on their website. 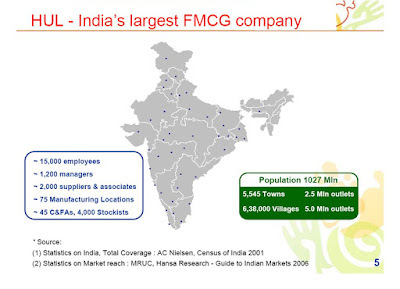 Notice that the claim is; HUL is India's biggest FMCG company. A tall claim but everyone in the FMCG business knows it already. Moreover, it is coming from a credible source, the CEO himself. Yet the source is mentioned. To keep the skeptics quiet. The source is; for reach data 'Hansa Research's Guide to Indian Markets 2006'. If you wish to check the claim, you know where to go and ask for it. 1.You need to write the source to add an extra dose of credibility to your claim. 2. The taller the claim you make, the more the need for the source. If you are using words like best, most, largest, be ready to back it up with the source. 3. When you are presenting data from within your domain (area of expertise), do not mention the source. When you are going out of your domain always mention the source. 4. Mention the source below the chart in legible font size. 5. Remember, you trust yourself more than others trust you. You are honest does not mean you will not furnish the data source.